This hand-knotted wool Indian carpet contains a touch of silk. Crafted in the ancient city of Jaipur, traditionally rugs from this area were an inspiration to William Morris and other noted Arts & Crafts leaders. This design is from a carpet woven during the reign of Jahangir (r. 1605-1627) when trade with the West brought European botanical paintings to India. 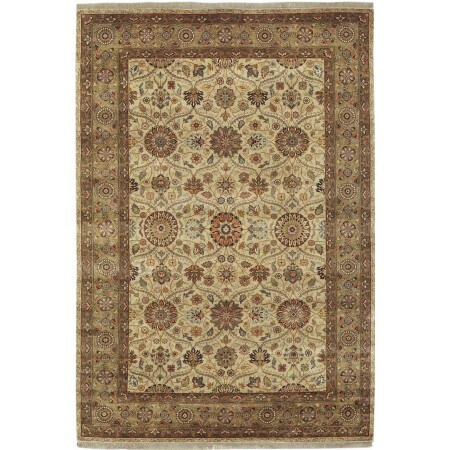 The flower heads on this superb rug fall within a trellis formed by curved serrated leaves. The color palette reflects the traditional colors from the Rajasthan region where Jaipur is located. Similar floral work can be seen on the walls, ceiling, and floor of the famed Taj Mahal.